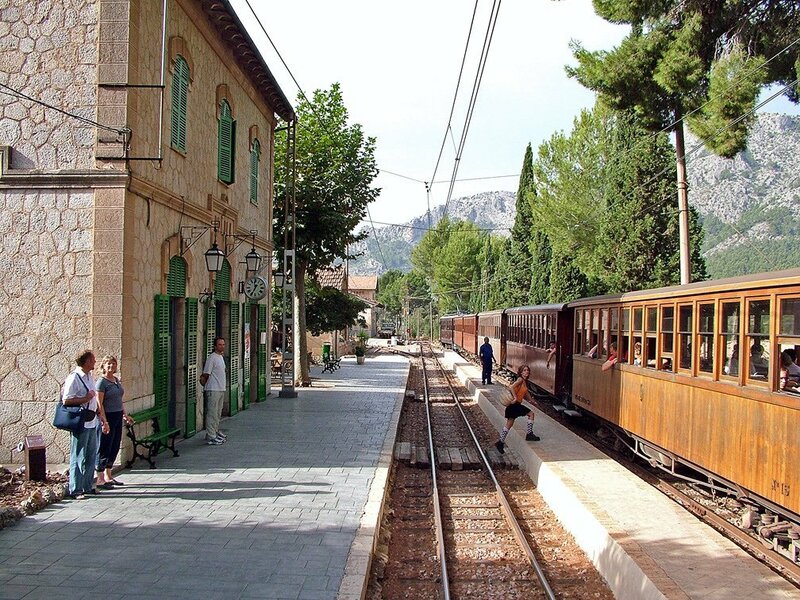 No visit to Mallorca is complete without a jaunt on the Palma to Soller train. 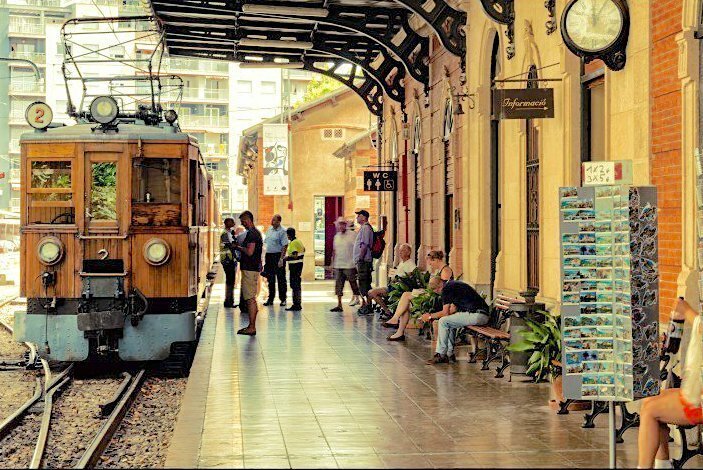 Your journey, taking an hour to cover the 27 km, will begin in the ticket hall of Palma or Soller train stations which themselves are an historical treat. 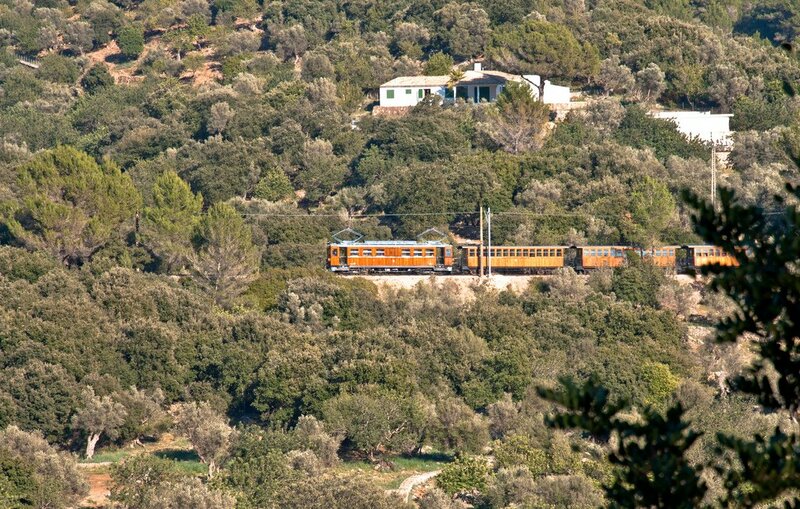 If you are limited on time and have a car you can board the train at Bunyola, to enjoy the last mountain stretch before Soller, a journey of just 25 minutes. In the heart of the Tramuntana mountain range, there lay a hidden valley containing the villages of Fornalutx, Biniaraix, Sóller and its port. Bursting with citrus fruits, its isolation was hampering its development, as travel to Palma, via the Coll de Sóller was a steep and arduous journey. 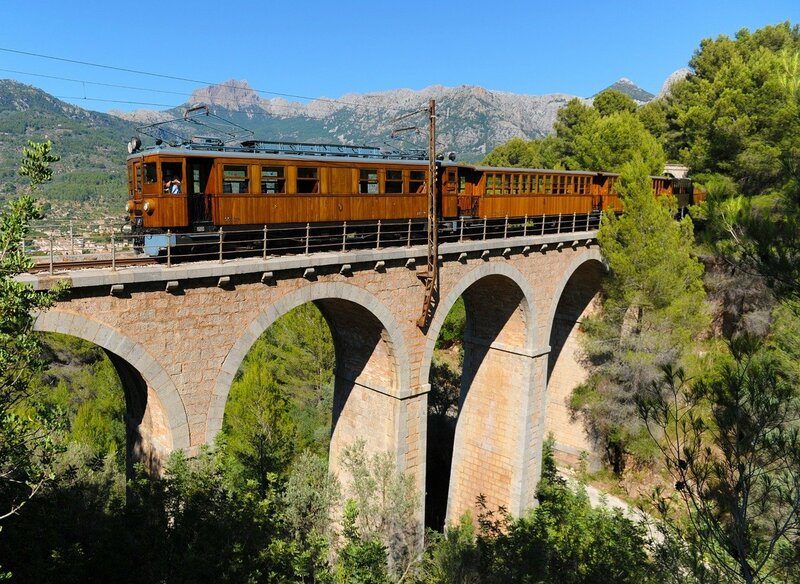 A proposal to build a direct Palma-Sóller railway which would pass via a tunnel under the Sierra de Tramuntana mountains was approved, and the first working train reached Sóller on 30th September of 1911. The `orange express´, as it was fondly referred to, now carries the thousands of visitors who marvel at this slice of history still in operation. Assuming you have boarded in Palma, there is an air of excitement as you board your 100 year old carriage and the whistle blows. As the train pulls out, you will amble along through Palma´s streets, heading north into the flat and fertile agricultural lands. After 30 minutes, the train has its only scheduled stop at Bunyola Station, at the foothills of the Tramuntana mountains. Now begins the thrill of tunnels, bridges and 5 arched viaduct as the train twist and turns, making a brief photo stop, above the exquisite town of Sóller overlooked by the towering Penyal de Migdia in all its glory above it. Then the gentle long decent into town, marking the end of a memorable journey ! Not sure why to stay yet ? Then take a look at our collection of hotels all with special offers. 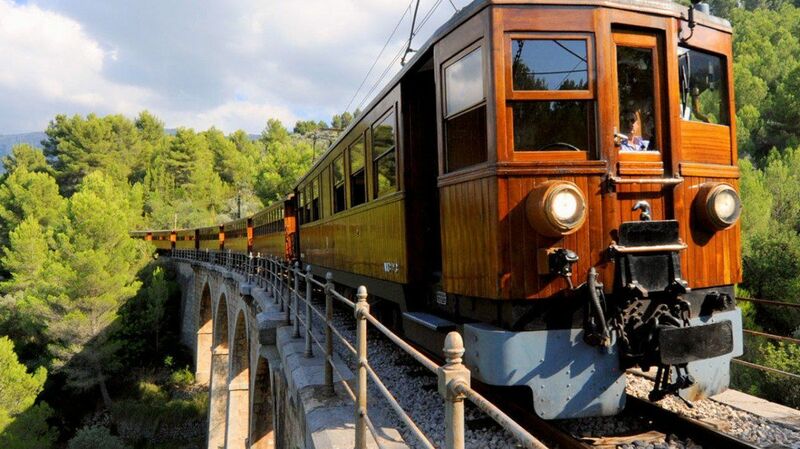 Please note: The train service is suspended each year from mid December until the end of January to facilitate maintenance and repair so please check the Tren de Sóller website. Images kindly provided by Udo Schroter.